This computer-generated image reveals the "skeleton" of the universe: the organization of matter at very large scales (the image shows a distance of 300 million light-years on each side). Scientists with POLARBEAR announced recently that light from the early universe can help them see this skeleton, and the large-scale distribution of matter. Scientists may soon get a look at the universe's skeleton by taking a close look at light left over from the Big Bang, which can be used to reveal the presence of matter like stars, galaxies, black holes and even larger structures in the otherwise empty universe. It's a lot like an X-ray revealing bones in a body, but on a cosmic scale. X-ray machines work by shining light over an entire area and detecting how different materials react. The light passes through tissue, but is stopped by bone. "We're using the light that we've usually used to measure the seeds of the structure of the universe, to measure the whole tree," said Adrian Lee, a professor of physics at the University of California Berkeley, and a lead scientist with POLARBEAR. "But the mechanism [we use] is pretty different. Instead of looking at a baby picture, we're looking at the distortion of the baby picture." Just as the bones in a skeleton are not randomly scattered in the body, the mass in the universe is not randomly scattered through space. Forces such as gravity drive the organization of matter, so stars get grouped into galaxies; galaxies herd together into galaxy clusters; and on an even larger scale, scientists think matter in the universe is arranged into a structure resembling a web, with vast regions of emptiness between strings of galaxy groups. The gravity of massive objects can bend light. The light moves around the object like water going around a rock in a stream. This bending causes a change in the CMB, and POLARBEAR scientists say they have now detected that change. The bending of light by a massive object is called gravitational lensing, and it changes a property of the light called polarization. When sunlight reflects off the surface of water, it often becomes polarized. Polarizing sunglasses can block this polarized light, but they do not block the sunlight coming from above — ideal for water sport fans. CMB light that has not been gravitationally lensed — that has never bumped into any type of matter — has a so-called E-mode polarization. New results from the collaboration show that the researchers can detect something called B-mode polarization, which means the CMB has encountered a massive object on the way to Earth. POLARBEAR has only just demonstrated that it can detect this polarization, but eventually, it could create a sketch of the large-scale skeleton inside the universal body. The Huan Tran Telescope, located in Chile's Atacama Desert, looks for light left over from the big bang. Scientists with the POLARBEAR collaboration want to use that light to map the location of matter in the universe. Seeing the universe's skeleton — the location and structure of all matter — could tell scientists if they've got the right idea about how matter in the universe is arranged, and if there are yet-unknown forces acting on it in peculiar ways. "There's some possibility [the structure] won't look the way theorists predict," Lee said. "[POLARBEAR] could confirm that the universe is acting the way we think it is; that there are no exotic dragons out there changing the signal." The most dominant force in our universe is dark energy, but scientists know very little about it -- only that it's causing our universe to expand like a balloon. They don't know when dark energy started this expansion, but Lee said it would have had an effect on how structures formed. "Gravity wants to pull structures together but dark energy wants to pull them apart," Lee said. 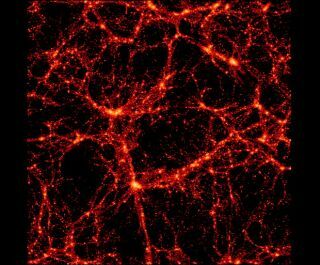 "If dark energy was acting more strongly early on in the universe that would suppress structure formation, because [the dark energy] would be yanking masses away from each other." Lee said future data from POLARBEAR could help identify when dark energy started pushing the universe apart. Earlier this year, members of the BICEP2 collaboration announced that they had detected B-mode polarization in the CMB. But that polarization signal comes from a different source than the one detected by POLARBEAR. The BICEP2 polarization may come from gravitational waves, or ripples in space-time, in the early universe. Detection of this type of B-mode polarization would indirectly demonstrate the existence of gravitational waves, and their presence in our early universe. But following BICEP2's announcement, observations by the Planck satellite have raised questions about whether the results were contaminated by space dust. It's possible, said Lee, that POLARBEAR could eventually measure polarization created by gravitational waves from the inflating universe. Those polarization patterns are larger on the sky than the lensing polarization that POLARBEAR has measured, but as BICEP2 has shown, they are in some ways more challenging to observe. POLARBEAR's observations alone can provide only a two-dimensional map of the matter in the universe. But with the help of other telescopes, Lee said it would be possible to create a three-dimensional map, and to even determine when the structure appeared in the universe. "If we use other data, if we cross correlate, we could look at the structure of matter over the whole history of the universe," Lee said. "That's the strength of all the data sets together."